KATIE: You know, Waffles...that's Glogirly's recycling bag. She's got lots of leftover papers from doing taxes. If I were you, I'd look out. You just might end up in the recycling. Which by the way would really screw up things for the recycling people. Pretty sure orange cats can't be put in with the single-stream recyclables. WAFFLES: What kind of food containers are we talking about? Glogirly finished up her part of the taxes last week. With all the papers and bags strewn about the office, Waffles was having all sorts of fun sorting paperwork. Taxes are a little untraditional for us. Glogirly puts together earning and spending reports that she mails to Gloman back in Minnesota. He did all of his prep this past weekend. Then Gloman brings everything with him to a meeting with the tax man. Glogirly calls in and does the meeting via conference call. In her cat pajamas. And slippers. We're pretty sure Gloman doesn't wear his cat pajamas to the tax man meeting. No cats were harmed during the taking of the above photos. And no cats were left unattended while the paper bag still had handles. If your kitty loves to play with bags, please be sure to remove any handles so that they don't get their heads caught in them. Great PSA! 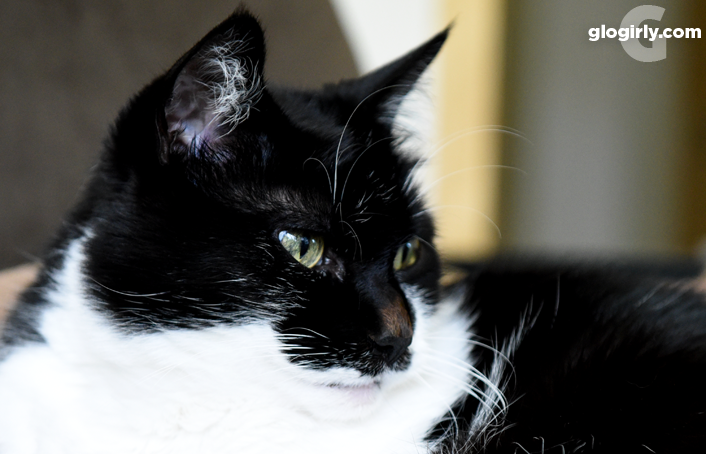 Cupcake had a run-in with a shopping bag handle back in December when she was being nosy about the bag our human's eyeglasses came in. You have never seen such a huge tail as hers that day. We are always concerned about bags because Allie had an incident years ago. Darling pics! We learned the hard way about bag handles, good to advise to cut them off. Tax time is never fun. You should hear our humans complain about them. 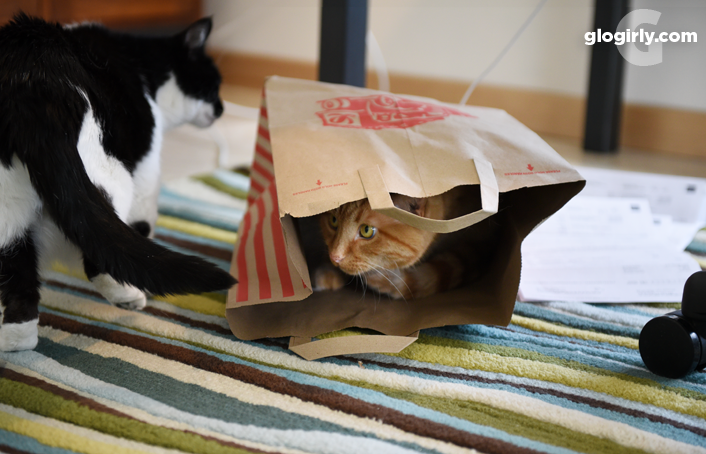 We hope you get an extra bag just for kitties, Waffles. Waffles, you and Katie are lucky that you too don't have to file tax reports too! 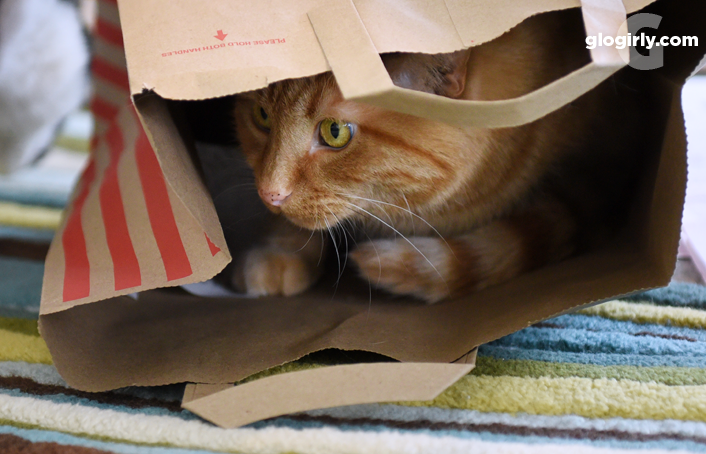 My human is pretty good about snipping the handles on paper bags. She is not so good about actually leaving them around for us to play with! I have a photo of Tubby in my recyling bag too. They are so cute when they do that. Mum makes sure all bags are carefully folded so I can't get in them. She had Derby get all freaked out one time with a bag. Now she is super careful. Ah Glogirly is such a good cat mama. She doesn't let anything pass her when it comes to you guys and giving us great tips. I always have my eyes on mine too when they go in bags with handles. Playtime with mama then carefully storing them away from kitties. I have my own Gloman for taxes. Phew! I can stay in my pj's too!